« Have You Tried the Coffee Nap? I’ve got a small driveway and sidewalk in addition to some porch steps I need to take care of during bad winter weather. Sure, my husband shovels and salts before he heads off to work in the morning, but usually when it snows it keeps on going such that we have to go out there a few times to take care of things during the day. Now that I’ve got three kids, one of whom rides the school bus, taking care of the snow outside has been a big challenge! Here’s what I’ve been doing the past week or so. I set my shoe alarm a little bit earlier to account for all the added bundling and boots and mittens we need before we walk to the bus stop. I am not super confident yet getting my 5-month-old baby in a back carry, so I stick him in a fleece bunting and put him in the wrap in a front carry. He goes over a fleece I’m wearing, then inside a fleece babywearing vest, and then I usually put my coat unzipped over that. I can use the unzipped coat to block wind from the baby as needed and he keeps my front pretty warm in the vest. I put the baby on before dressing the toddler, not because it’s easier but because if I dress the toddler first, he will remove everything while I’m wrapping the baby and I’d just have to do it all again anyway. My poor kindergartener is on his own except I end up helping him with his mittens most of the time. And then we journey to the bus stop through the snow and smushy sidewalk scuzz, because there’s just not enough time to take care of it beforehand. My children moan and wail as if we are the Donner party on their fated excursion. Once the bus takes my oldest son off to school, the younger boys and I get to shoveling. We are already outside, so it’s usually pretty easy to convince my toddler to help. He has his own tiny shovel, so that makes him much more likely to help. If he’s really being unhelpful and it’s super cold and I want to get inside quickly, I ask him to shovel the yard. Since I have the baby on my front, I wind up having to sort of shovel sideways. It’s not very effective and it takes a long time and it hurts my back! But we clear a safe path for the mail carrier and sprinkle enough salt that our afternoon walk to the bus stop will be dry and crunchy. I don’t even know how I will work it in if we need to clear off our minivan! 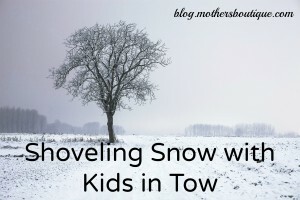 I’d love to hear from other moms who have experience–how do you take care of your snowy sidewalk with young kids in tow?